Code-named Utopic Unicorn, Ubuntu 14.10 is the last Ubuntu release this year. 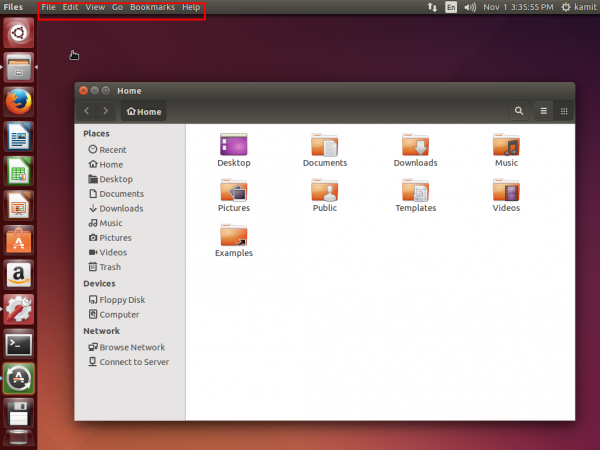 There are two releases per year and Ubuntu 14.04, code-named Trusty Tahr, was the first 2014 release of the popular desktop distribution that’s sponsored by Canonical. 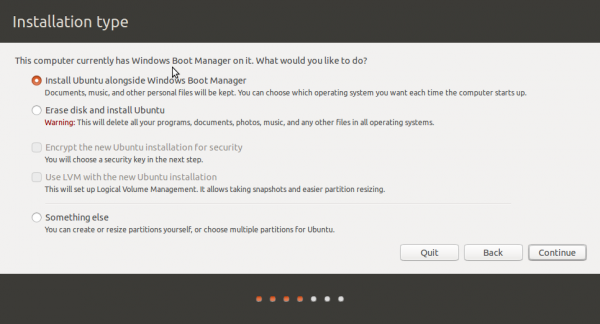 Ubuntu is, of course, not just a desktop distribution, but also features server, Cloud and Kylin editions. 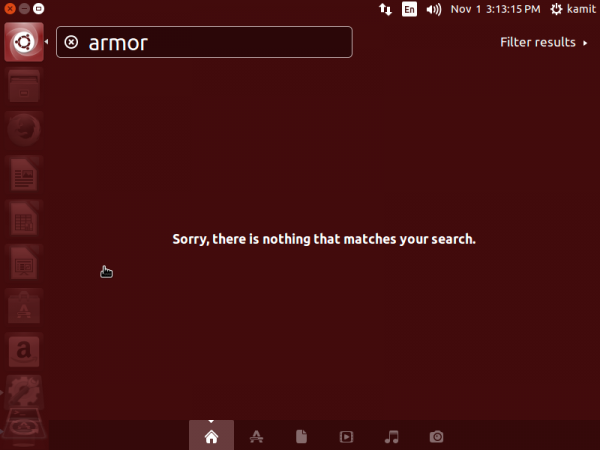 Ubuntu Kylin is an edition specifically designed for Chinese users. This review will be just about the desktop edition. According to the Release Notes, Ubuntu 14.10 is not an LTS (Long-Term Support) edition, and so it will be supported for just nine months, that is until July 2015. Which brings up a question I’m sure has been tackled before: Why release a distribution that will be supported for just nine months? And why would any person bother upgrading to an OS that will be supported for just nine months. Even Microsoft doesn’t do that. If I were Mark Shuttleworth, I’d scrap this LTS release thing and reduce the number of releases per year to just one. 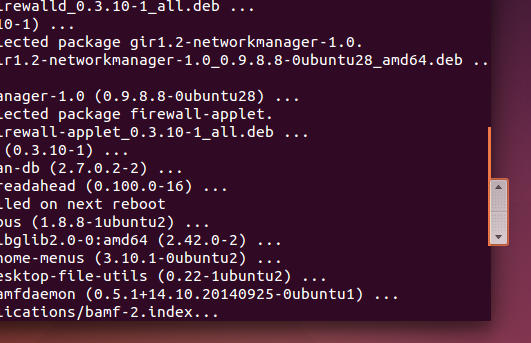 That development model is being used by Zentyal, a server distribution that’s actually based on Ubuntu. But I don’t see Mark listening to any thing like that, so I’ll let it go. That should make many users happy. 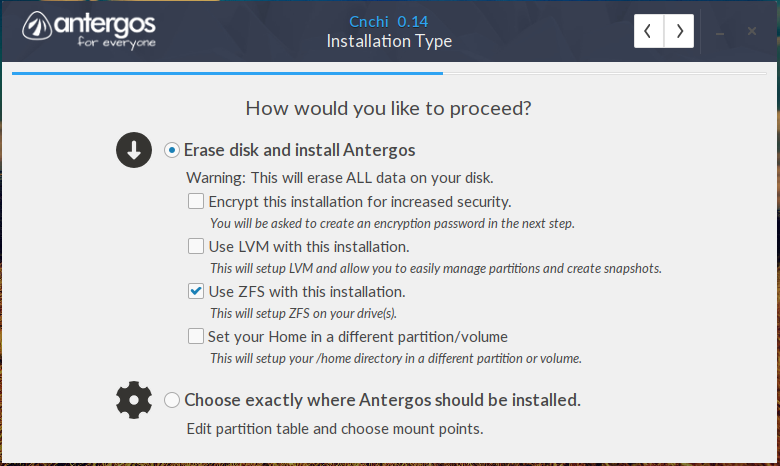 There’s no entry for the distribution’s installer in the Release Notes, but while attempting to dual-boot Ubuntu 14.10 and Windows 8 on a computer with UEFI firmware, I observed that it reported at the Installation type step that “This computer currently has Windows Boot Manager on it. What would you like to do?” That’s an improvement, because in previous editions, the installer tended to report “This computer currently has no detected operating system”, even when there’s one on the target hard drive. Sometimes that led to taking drastic solutions lie the one documented at Zap GPT data structures from a disk, while preserving existing MBR partitions. So yes, that’s an improvement. Other than that, I didn’t observe any other improvement in the installer. 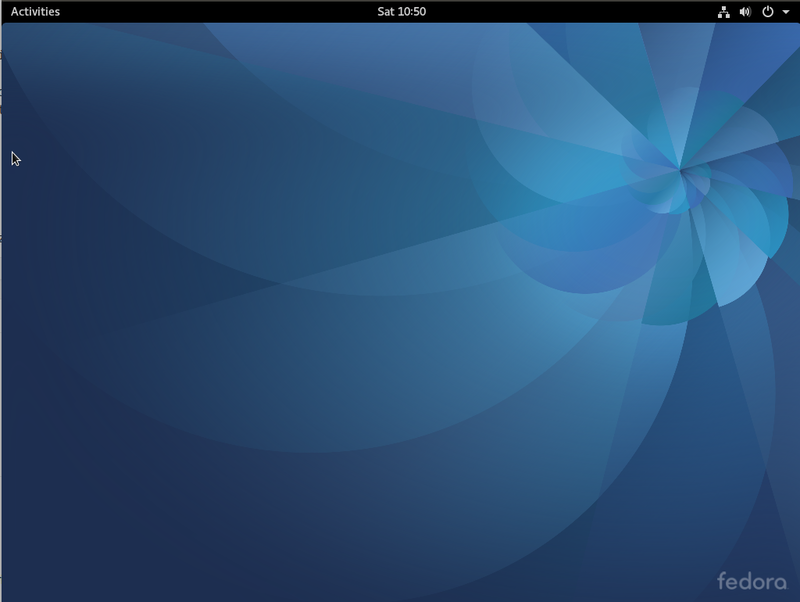 On the desktop, Ubuntu 14.10 looked very good. Actually, this edition is the first one I’ve ever used on a laptop with a display that’s more than 12-inches. And it looked very good, even better than the factory installed OS that shipped with the computer. That OS is Windows 8 and the laptop is a Toshiba Satellite C55-A. (See Dual-boot Ubuntu 14.10 and Window 8 on a Toshiba Satellite C55-A). 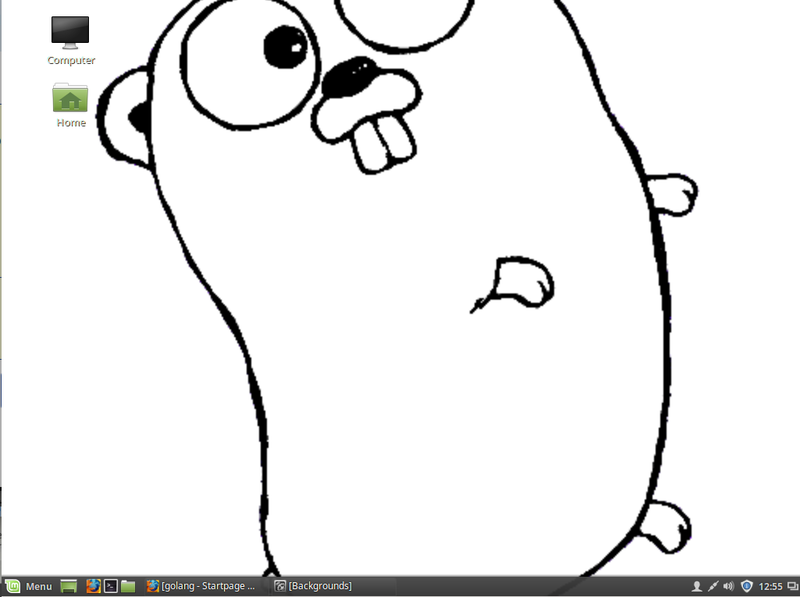 This is a screenshot of the desktop. 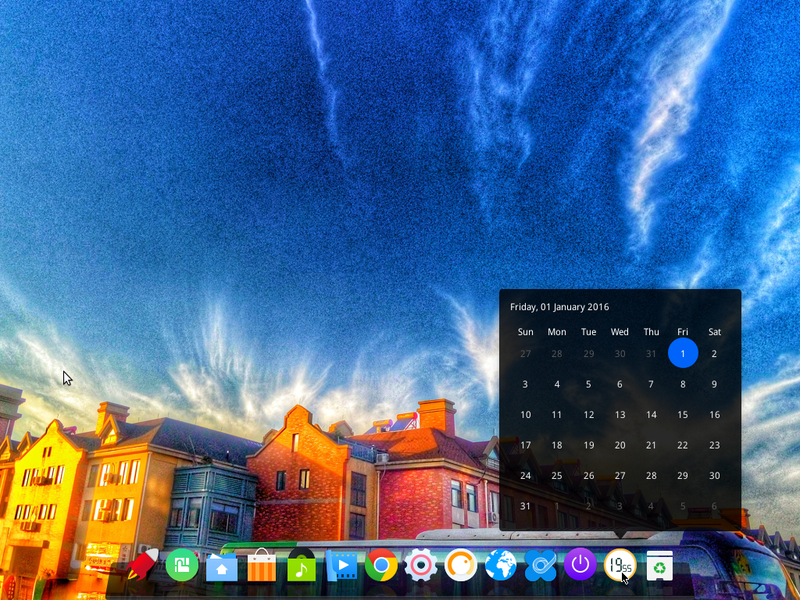 On a small screen, like a laptop with a display that’s 12-inches or less, that launcher kinda gets in the way. Luckily, it can be set to auto-hide. 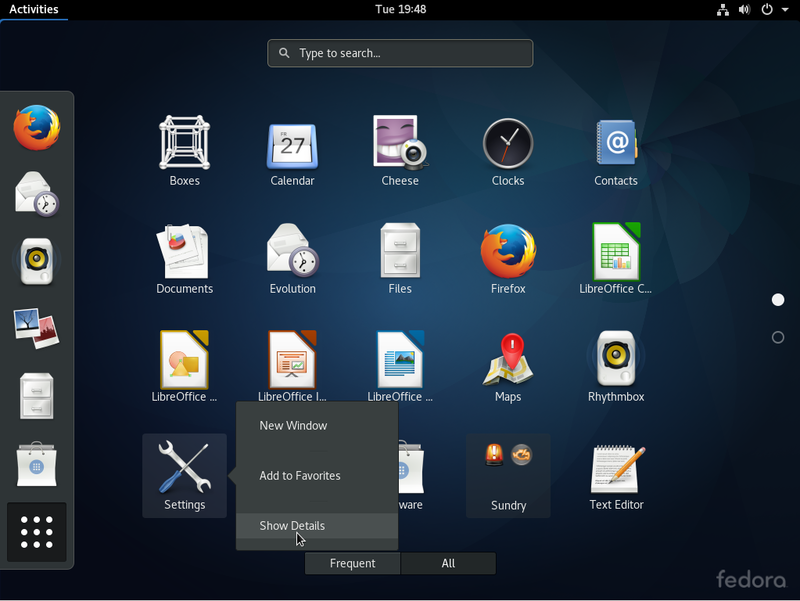 When you enter a search term into the dash Ubuntu will search your Ubuntu computer and will record the search terms locally. Unless you have opted out (see the “Online Search” section below), we will also send your keystrokes as a search term to productsearch.ubuntu.com and selected third parties so that we may complement your search results with online search results from such third parties including: Facebook, Twitter, BBC and Amazon. Canonical and these selected third parties will collect your search terms and use them to provide you with search results while using Ubuntu. the storage of your search terms and IP address by Canonical and such selected third parties (if applicable). Although most changes are likely to be minor, Canonical may change this legal notice from time to time, and at Canonical’s sole discretion. Please check this page from time to time for any changes to this legal notice as we will not be able to notify you directly. Please submit any questions or comments about searching in the dash or this legal notice by contacting us at the following address: Canonical Group Ltd, 5th Floor, Blue Fin Building, 110 Southwark Street, London, England, SE1 0SU. So unless you opt out, any search string you enter in the Dash, along with your IP address, will be sent to Canonical and its partners. Those “partners” include Facebook, Twitter, BBC, Amazon and… It’s not bad enough that Facebook can mess with your emotions from your Facebook account, but they could also do it right from the Ubuntu Dash. Because what stops those guys from using the search terms you type in the Dash to play with your emotions? Nothing, really! Thankfully, opting out of online search takes just four (4) mouse clicks. So if this means anything to you, as it does to me, the first thing you probably want to do, right after installing Ubuntu 14.10, is disable online search. Aside from making sure that my search terms are not sent to some remote server, I’d also rather see a result like this. Instead of this. There was a time when I subscribed to the idea of searching online from my distribution’s menu, but that was before it was revealed that everything I searched for will be sent to “partners” like Facebook. Another aspect of the default desktop setting that’s not very user-friendly, is the position of window menus. By default, it’s on the desktop’s menu bar instead of the application’s title bar where it really belongs. Yet another part of the default desktop that’s not kosher, is the scrollbar. It’s not just that it can get in the way, but its behavior is not even consistent. It can be outside or inside an application’s window. 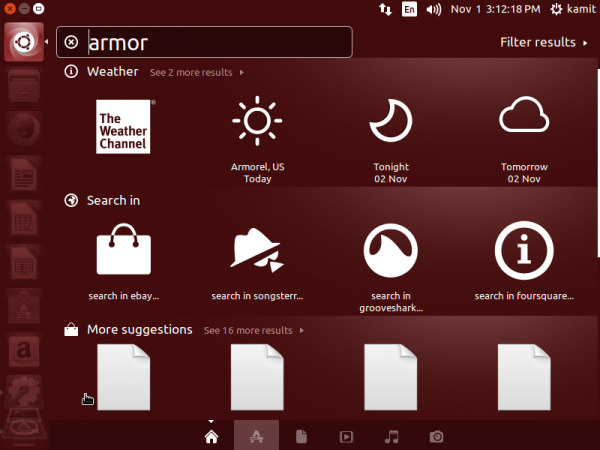 This screenshot shows it inside an application’s window. This one shows it outside. As is this one. This is backwards innovation. 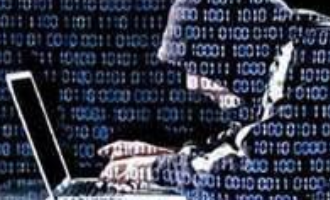 The saving grace of the Ubuntu Desktop is that those annoying default settings can be modified or changed from the Appearances and Security & Privacy modules of System Settings. Getting rid of the scrollbar requires removing a couple of packages. While a couple of modules in the System Settings can be used to modify a few default settings, the Unity Tweak Tool does a whole lot more. 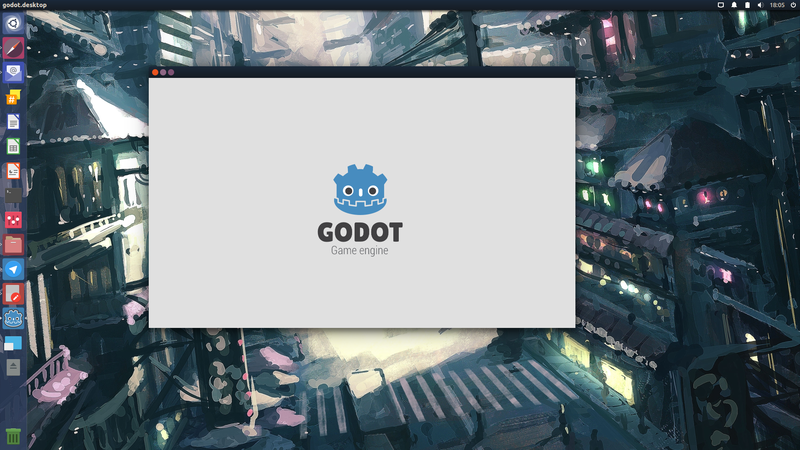 It’s the best graphical application to use for tweaking desktop settings. Though it’s not installed out of the box, it can be installed from the command line of from the Software Center. 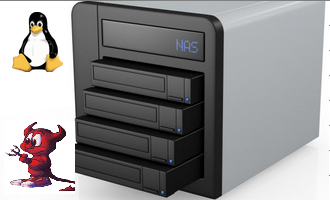 One feature that I’d love to see integrated into System Settings, is firewall/system security configurations. 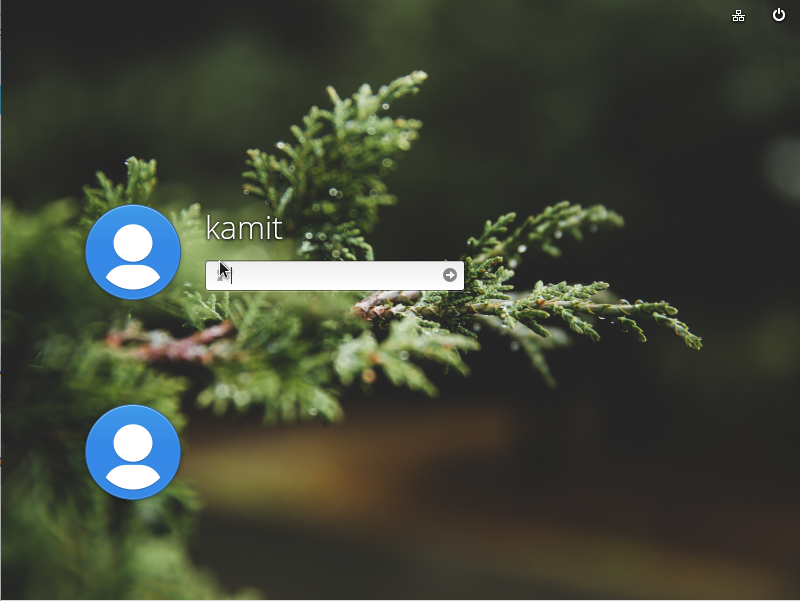 KDE has it (part of it anyway) and the latest preview release of Elementary OS also features part of it (see elementary OS Freya beta review). 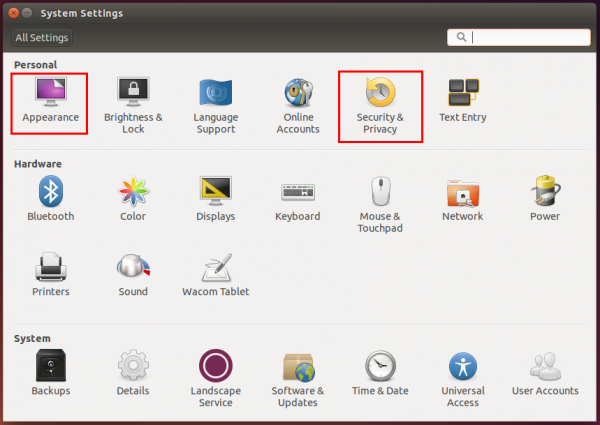 Considering that most of the settings in the Security & Privacy module of Ubuntu’s System Settings concern search and reporting, I think it should be renamed to Search & Privacy, and a new Firewall & Security module created under the System section. If you’re reading this paragraph, you’d already have figured out that Ubuntu Desktop is not my favorite desktop distribution. But that doesn’t take anything away from the fact that it is a very good desktop distribution and I highly recommend it for new users. Just be sure, if you’re a new convert, to install Install Unity Tweak Tool on Ubuntu 14.10 and tweak it to your heart’s content. Make disabling online search the first item on your list – unless you don’t mind your search strings being delivered to Canonical and Co.
To download an ISO installation image of Ubuntu 14.10 for your platform, click here. You may read the Release Notes. This 14.10 also breaks my Open GL for steam. Damn thing won’t render in any Ubuntu based distro. 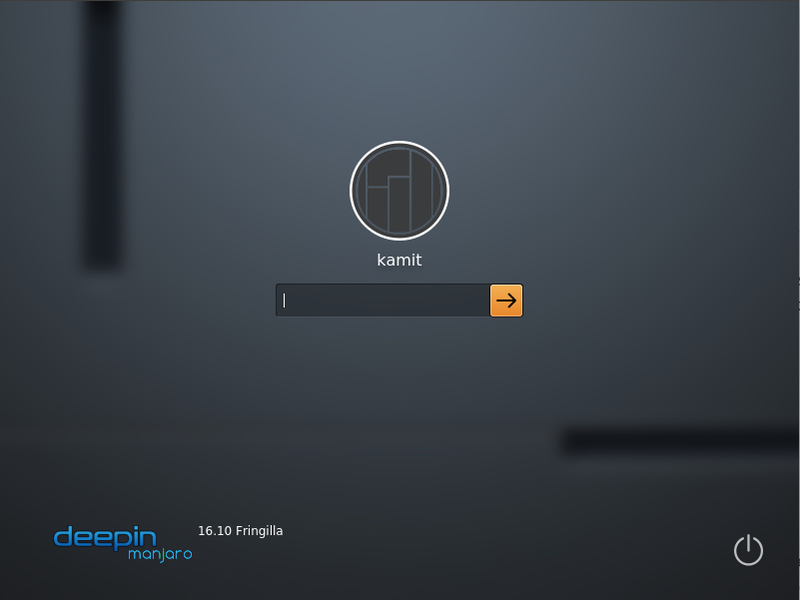 Tried zorin, Ubuntu, PCLinuxOS….all versions broke steam Open GL rendering. So can’t game at all. So much to new and improved I will have to dig out an earlier install of Ubuntu to play my games. 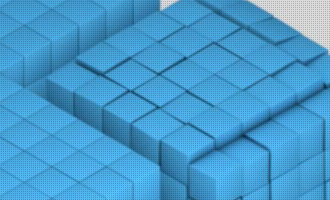 Have you tried Fedora, ROSA or any Arch-based distro? Tried Netrunner Rolling and wouldnt do a dual boot auto next to my Windows and Linux partition. 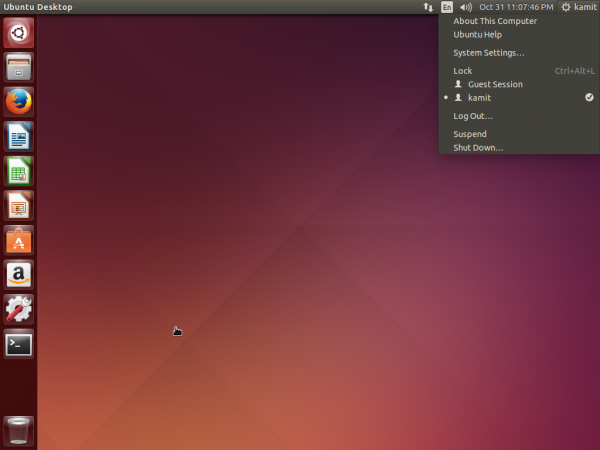 Dug up my older 14.04 copy of Ubuntu Studio and that seems to work. I will just leave off patching it till 14.10 has had a month or so of updates to fix itself.